Sizing 20 to 24.5 circumference. One size fits most. 6-⅜ inch to 7-⅞ inch. One size fits most. N/A. One size fits most. One size fits most. 20 to 24.5 inches. One size fits most. One size fits most. Dimensions 12 x 9 x 6.5 inches. 6.5 x 9.2 x 12 inches. 14 x 14 x 10 inches. 12.4 x 9.4 x 7 inches. N/A. 9 x 12 x 6.75 inches. 12 x 9 x 7 inches. 12 x 12 x 12 inches. 14 x 14 x 12 inches. 10.2 x 11.5 x 4.5 inches. Weight 2.6 pounds. 1.7 pounds. 1.32 pounds. 2.4 pounds. 3 pounds. 4.4 pounds. 2.2 pounds. 2.2 pounds. 2 pounds. 2.8 pounds. Safety rating (if applicable) ANSI, CE, Z89.1-2003 ANSI. ANSI Z89.1-2003 Class G-E-C. ANSI Z89.1-2009 Type I Class E. N/A. Class G certified, NRR 22 hearing protection. N/A. ANSI Z89.1-2009, type I, class E, G, an C, ANSI S12.42.2010. ANSI Z89.1-2009, Type 1, Class C. ANSI Z89.1-2003 Class G-E. ANSI Z89.1-2009, Type 1 Class C, E and G.
How to Select the Best Chainsaw Helmet? In almost every dangerous situation we put ourselves in, we wear helmets. When we learn to ride a bike, we wear a helmet. When we play football, we wear a helmet. When we compete in motorsport or go abseiling, we wear a helmet. Why should operating the most dangerous power tool be any different? Protect your head and do it properly with the best chainsaw helmet on the market. It can be hard to know what the best chainsaw helmet for the money is, especially if you’re not sure of your requirements. First you must discover the kind of work you will be undertaking. From here you can find out whether a professional helmet is required, or if a standard hard hat will suffice. It’s a common misconception that helmets aren’t needed for general home maintenance, but safety is crucial. Your head must be protected from falling branches or limbs. 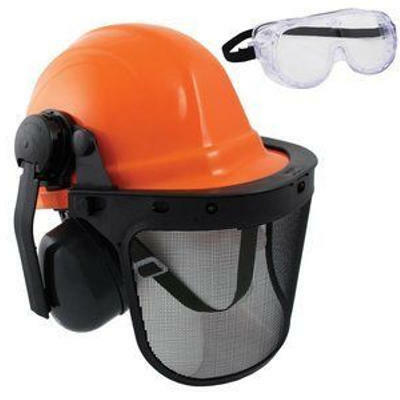 If you’re undertaking forestry work, you will need something a bit more professional with visors, vents and extra protection. Understanding your work type is the key to choosing the right helmet for the job. Different helmets require different maintenance to be undertaken. For example, a simple hard hat might need a wipe or rinse to remove debris, but a professional forestry helmet could include having the lining removed for washing, and different components replaced if they break or wear out. A professional helmet must be kept in the best condition possible to ensure it remains effective out in the field. In order to get the best wear out of your chainsaw helmet, it must be made of durable and quality materials. In this buying guide we will show you 10 suppliers of chainsaw helmets in order for you to make an informed decision. Many vary in durability – with some featuring higher grade materials or parts with better manufacturing processes. Plastic or steel mesh visors. Although it’s good to have a budget in mind when you’re shopping for a new chainsaw helmet, you should never skimp on quality. Choose a helmet which offers quality features, plenty of protection and comfort opposed to the cheapest on the market. Compare many brands and make the decision based on what will offer the best protection for longer. In many cases, a more expensive helmet can be a good indication that it offers better protection or has better technology for professionals. It’s a 5-in-1 safety helmet with earmuffs and two visors. It has a dial knob to adjust the circumference from 20 to 24.5 inches. The visors are lightweight and shield from debris. It suits a wide range of chainsaw users. It doesn’t come with instructions for assembly. Some components appear cheaply made and can break easily. The earmuff padding can come off easily for some users. Some users note that overall, they aren’t very durable. Sizing: 20 to 24.5 circumference. Dimensions: 12 x 9 x 6.5 inches. Safety rating (if applicable): ANSI, CE, Z89.1-2003 ANSI. QWhat is the 5-in-1 feature? AHard hat, hard hat with ear muffs, hard hat with ear muffs and plastic visor, hard hat with mesh visor, hard hat with ear muffs and mesh visor. QWhat is the sound reduction amount? QWhat color is the helmet? For an industrial forestry helmet, this 5-in-1 helmet misses the mark on durability and quality. Although it’s functional and comes with plenty of options for use, some users note the parts are poorly made. It comes with earmuffs and two visors which make it functional for both homeowners and industry professionals, but it wouldn’t be suitable for every day, heavy use. It’s affordable but it’s not top rated, nor is it the best chainsaw helmet for the money. Check out what other people who purchased this product think about it. 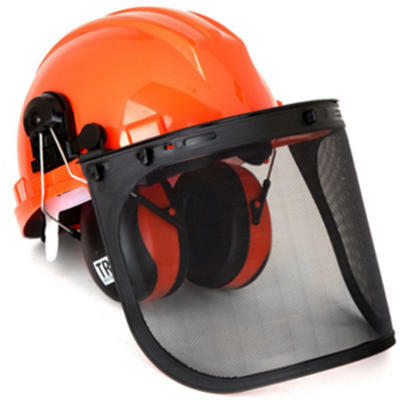 Read TR Industrial Forestry chainsaw safety helmet reviews. It has adjustable 6-point suspension. It has 25DB hearing protection. It has a face screen for protection from debris. It’s good for wet weather use as it offers a rain neck protector. The ‘one size fits most’ sizing means it may not suit those with very small or very large heads. Sawdust is difficult to get out of the face screen which affects visibility. It’s not OSHA rated for frontal or side impact. Dimensions: 6.5 x 9.2 x 12 inches. Safety rating (if applicable): ANSI Z89.1-2003 Class G-E-C.
QDoes it come with a chin strap? QDoes it have a type i or type ii safety rating? You get what you pay for, and what you pay for is a whole lot of quality! True to its brand, this Husqvarna chainsaw helmet is as good as it gets. It offers durable components to create an all-round quality helmet system, and it’s perfect for professionals or casual users. It’s easy to see, easy to assemble and easy to purchase replacement parts for. It’s even comfortable in the rain with the rain neck protector. All your needs are catered for with this helmet system and it’s top rated for this reason. It’s easily one of the best chainsaw helmets for the money. Check out what other people who purchased this product think about it. Read Husqvarna ProForest chainsaw safety helmet reviews. It has front slots for mounting a headlamp. Although used for rescue operations, many arborists own them for chainsaw use so it’s very flexible in its use. It has slots for ear protection. The sizing is a little on the small side. It has quite a high price tag for what it is. Sizing: 6-⅜ inch to 7-⅞ inch. Dimensions: 14 x 14 x 10 inches. Safety rating (if applicable): ANSI Z89.1-2009 Type I Class E.
QWhat is it made out of? AABS, polycarbonate, polyester, nylon and polyethylene. QDoes it have a clip for a headlamp? QDoes it have a chin strap? Although this helmet is in the medium-to-high price range and has smaller sizing, it fits the bill as a reliable and well made helmet. Although its primary use is for rescue operations, many arborists own them due to how lightweight they are. They are not cumbersome when high in trees, and they are easy to put on and take off. They are also constructed of quality materials for exceptional durability. Overall this can easily be considered one of the best chainsaw helmets for the money. Check out what other people who purchased this product think about it. 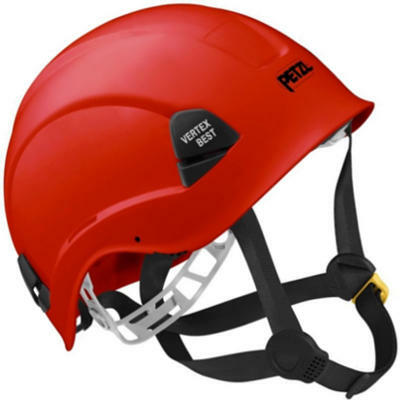 Read Petzl Pro Vertex chainsaw safety helmet reviews. The visor is easy to change. It’s available in either yellow or orange for good visibility. You don’t get to specify your color choice of yellow or orange. Dimensions: 12.4 x 9.4 x 7 inches. QWhat kind of headband is within the helmet? QIs the helmet yellow or orange? AIt can arrive in either color. QWhat accessories does it come with? AA neck rain protector, visor and earmuffs. Representing good value for money, this ISE helmet is a good example of what a forestry helmet should be. It offers a 3-in-1 system with visor and earmuffs and is durable for use by professionals or homeowners. It’s manufactured of quality materials, the parts clip together well and it’s bright for easy visibility out in the field. It’s also for sale at a very low cost which makes it one of the best chainsaw helmets for the money. Check out what other people who purchased this product think about it. Read ISE chainsaw safety helmet reviews. The parts are easy to replace. 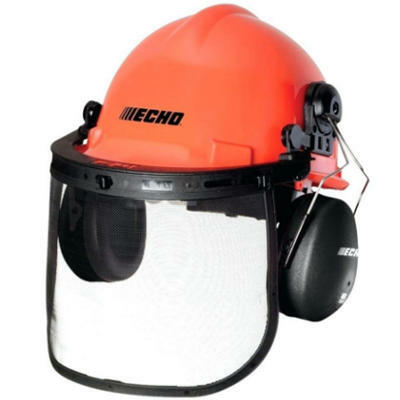 The visor provides excellent protection against debris from chainsaws and weed-eaters. Some parts appear to be poorly made. It’s quite heavy in comparison to some other models. You can’t wipe sweat from your brow without lifting up the visor. Safety rating (if applicable): Class G certified, NRR 22 hearing protection. QWhat noise rating does it have? QWho is it targeted to? QCan the earmuffs be removed? This is a fine example of a comfortable homeowner’s helmet system with full protection for general backyard dangers. It offers good ear protection and the visor protects well against bark and stones flicking up from the blade of a chainsaw or a weedeater. 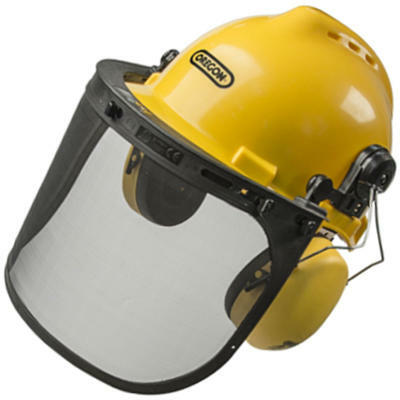 It’s also very competitively priced, is well constructed and is a safe all-round light maintenance helmet. For this reason it’s easily considered one of the best chainsaw helmets on the market. Check out what other people who purchased this product think about it. 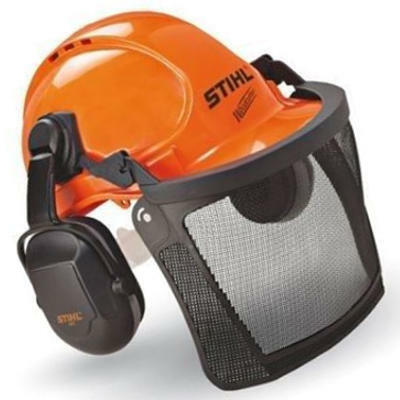 Read STIHL WoodCutter chainsaw safety helmet reviews. It’s suitable for homeowners or professionals. It’s bright orange for good visibility. It’s adjustable to fit most, if not all, heads. It’s very expensive in comparison to some other manufacturers and brands. The instructions aren’t very clear for assembly. Dimensions: 9 x 12 x 6.75 inches. QWhat comes with the helmet? AA mesh face visor and earmuffs. QCan the visor be removed? This helmet, although quite expensive and heavy, is a nice, durable helmet for both homeowners and industry professionals. 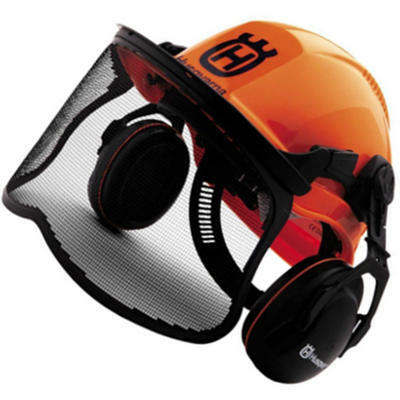 It provides ample face and ear protection, all the while keeping your head well protected. It’s bright orange for good visibility, is easy to assembly and has an easy-to-remove visor. It’s also simplistic in design which allows for minimal issues with durability. It’s easily one of the best chainsaw helmets for the money. It’s also very easy to purchase online from websites such as Home Depot. Check out what other people who purchased this product think about it. Read ECHO chainsaw safety helmet reviews. It provides plenty of ventilation with its six hole setup. It has a very durable and wider-than-normal stainless steel visor. It has noise reduction earmuffs. It’s relatively lightweight in comparison to some other brands and models. The earmuffs aren’t very durable and feel like they could break. It comes with poor instructions for assembly. It’s not as cost effective as other helmets for sale online. Dimensions: 12 x 9 x 7 inches. Safety rating (if applicable): ANSI Z89.1-2009, type I, class E, G, an C, ANSI S12.42.2010. QWho is this helmet targeted towards? AHomeowners and those needing to fell larger trees. This helmet doesn’t offer the same level of protection as other helmets do, but it still represents good value for money. The majority of the parts appear to be well made and durable, and it’s easy to assemble. 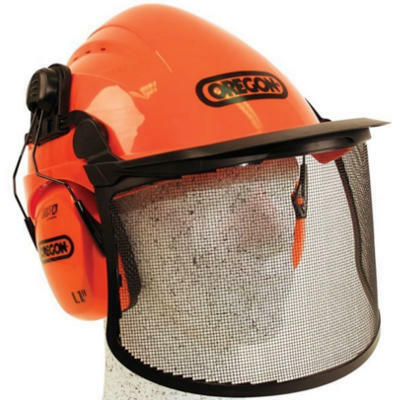 It’s a good base helmet for use in general home maintenance and tree felling. Check out what other people who purchased this product think about it. Read Oregon 563474 chainsaw safety helmet reviews. It’s a high impact resistant helmet to provide professionals and homeowners with top rated protection. It has a very absorbent sweatband. It offers good air flow. The earmuffs seem to hold the helmet better on the user’s head than the helmet itself does. The face shield is too short. The ear protection snaps loudly when locked down. It’s quite an expensive helmet option. Sizing: 20 to 24.5 inches. Dimensions: 12 x 12 x 12 inches. Safety rating (if applicable): ANSI Z89.1-2009, Type 1, Class C.
QWhat noise reduction can it offer? QWhat replacement parts can be purchased for this helmet? AEarmuff attachment, earmuffs, visor, neck protection, hygiene kits, suspension kits, sweatband. QDoes it have ventilation holes? This helmet is easily one of the best professional forestry helmets on the market. The parts are well made, the helmet is easy to assemble and it’s full of exceptional technology not often found in other brands of helmet. It’s comfortable for many users and also suits heads of between 20 and 24.5 inches in diameter. It is one of the most expensive helmets on the market, but it’s easy to see it’s also one of the best chainsaw helmets for the money. Check out what other people who purchased this product think about it. Read Oregon 562412 chainsaw safety helmet reviews. The helmet is well built. It has an adjustable six point suspension system with a ratchet. It has a rain shield and rain neck protector making it an all-weather helmet. It’s very difficult to assemble. Dimensions: 14 x 14 x 12 inches. Safety rating (if applicable): ANSI Z89.1-2003 Class G-E.
QWho does this helmet suit? Aside from being available online and in stores for a higher price tag than many other chainsaw helmet options, it still represents good buying. It’s very well made, very durable and has plenty of options to make the professional forestry worker comfortable. It works well in wet weather with its rain shield and neck protector, and is great in summer too with good ventilation. Overall this is one of the best chainsaw helmets for the money. Check out what other people who purchased this product think about it. Read Husqvarna 576235401 chainsaw safety helmet reviews. 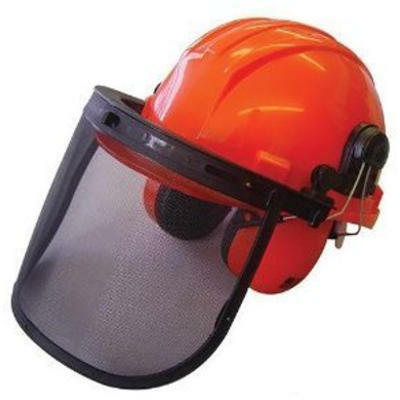 It has a durable steel mesh face screen perfect for stopping debris. The sound shield earmuffs protect the ears well. It comes with anti-fog goggles when many brands don’t. It offers a ratchet attachment system. The screen is coated to prevent glare and corrosion. The ‘one size fits most’ aspect may not cater to those with very small or very large heads. You have to assemble it yourself. It isn’t overly comfortable to wear. It doesn’t fit comfortably onto all heads. Dimensions: 10.2 x 11.5 x 4.5 inches. Safety rating (if applicable): ANSI Z89.1-2009, Type 1 Class C, E and G.
QAre the earmuffs and visor removable? AYes but it’s difficult to do so. Considering this helmet comes from a brand that doesn’t actively promote itself in the forestry industry, it’s a very well made helmet. It offers plenty of safety features that are both necessary and convenient and is well priced on the market to meet the needs of a wider audience. 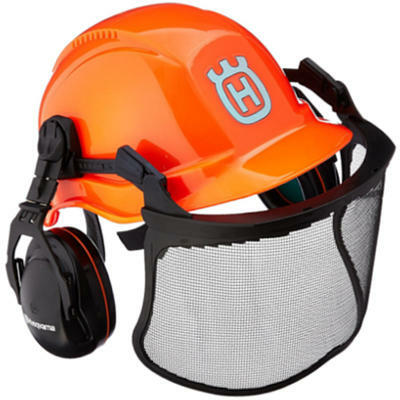 It has a convenient ratchet system, has a good visor for stopping debris and the earmuffs aid in reducing noise. Overall it’s certainly a top rated chainsaw helmet. Check out what other people who purchased this product think about it. Read ERB 14371 chainsaw safety helmet reviews. Where to Buy Chainsaw Helmet? Chainsaw helmets are easily purchased online and in leading hardware stores. However, in order to get the best deal possible and to check out reviews from other buyers, you are best to head online and purchase one from Amazon. They are often a lot more cost effective and can have optional extras thrown in as part of the package.